I’m here. I’m free now. This is how I saw myself, broken. But below is more accurate, just not yet assembled. I so wanted to blog next about either #Godisnotable or #Jesusthesmuggler, but if you click either of these links anytime soon, you’ll get the gist. For now, I not so randomly remembered the above Wintley Phipps quote and just had to share. I shared elsewhere that in the midst of feeling shattered, God spoke through someone else to remind me I’m not broken, but I am in pieces, and God will have to put me together, maybe for the first time. I know some of you may feel bruised by life circumstances, but just because a puzzle is in pieces, doesn’t mean it’s broken. I may have been cast down, but I am not utterly destroyed (2 Corinthians 4:8-10). In fact, that same passage reminds us that through our sufferings, we share in the suffering of Christ so that HIS life may be seen through ours! Come to God with your personal, private sufferings so He can put you together in compensation for your pain. What a great exchange! 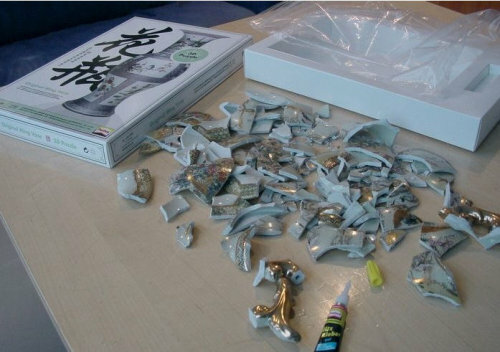 3-D Vase Puzzle – Not broken, just not assembled, yet.